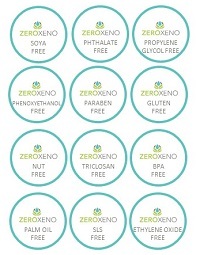 Zero Xeno incorporates the use of a natural preservative system for our organic personal care products. Our lotions include unique fermented preservatives. Fermenting coconut oil with Lactobacillus bacteria produces an effective and multi-functional product that provides natural preservation protection with bonus moisturizing benefits. Lactobacillus bacteria are one of the friendly species of microorganisms used to produce fermented products such as sauerkraut and kimchi. Like many members of the lactic acid bacteria family, lactobacillus are capable of restricting the growth of unfriendly microorganisms by acidifying its environment. Friendly bacteria also produce unique antimicrobial peptides known as bacteriocins which are capable of providing broad spectrum antibacterial and antifungal protection when used in cosmetic formulations. These amazing little peptides are made from amino acids which is why they're famous for anti-aging and supreme moisturization! For Zero Xeno products that don't contain preservatives, we are able to achieve natural preservation through the management of individualize pH for each product and their fatty acid content. Our use of distilled water is more costly but is key to keeping our products pure and clean. Additionally, scientific research has shown that various essential oils have innate natural preservation properties. Our individualize and unique preservation system was developed by our founder Bonnie Penner.